An old standby motorcycle horn and sometimes hard to find. Authoritative car-like tone but with disappointing results in our sound level readings. 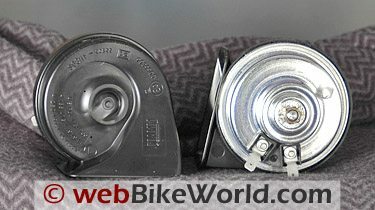 These have to be the most sought-after motorcycle horn replacements used today, but for some reason it isn’t all that easy to find a true pair of high/low real honest-to-goodness Fiamm Freeway Blasters. This pair was made by Fiamm USA, right here in the States Several years ago we published an article on installing a pair of Freeway Blaster horns on a BMW R65 (and K75) using a horn relay; that pair was also made in the U.S.A. The Freeway Blasters have a tone similar to the Stebel Magnum horns; they both sound more like automobile horns than motorcycle horns, which may or may not be desired. With a claimed rating of 132 dB at an unspecified distance, we were very surprised to discover that they only registered 89 dB at 2 feet on our Extech sound level meter, a massive -43 dB off the claimed maximum. 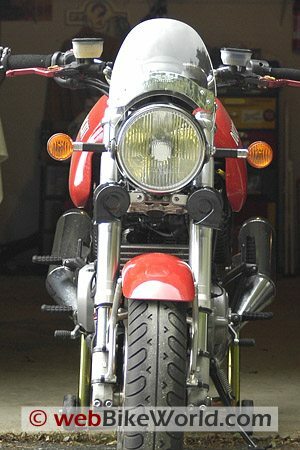 The pair of older Freeway Blasters mounted on the BMW R65 are located up front, behind the forks and pointing down and out to the sides. This mounting location is relatively unencumbered, especially compared to some motorcycles where the horns are buried behind a lot of bodywork or under the fuel tank. We didn’t record the sound level of that pair, but when activated, they seemed just as loud as the brand new Freeway Blasters used in this comparison, so we don’t think there’s a sound level problem with the U.S.-made horns. The Freeway Blasters could be mounted on the front of the GT1000, but their horns would be pointed outwards and/or down. They also don’t look as cool (or stupid, depending on your point of view) as the Hella Supertones when mounted on the front of the bike, although they could probably be painted some outrageous color. By the way, we also compared the Freeway Blasters with the Stebel Magnum and the Hella Supertone horns while the bike was parked inside the garage This isn’t recommended, because the sound is way too loud for human consumption! The Supertones still came in first at 103 dB in ghe garage, with the Stebel Magnum and Fiamm Freeway Blaster horns tied at 99-100 dB, so the Hella Supertone horns are still tops. 89 dB for the Freeway Blasters is still pretty loud though, about the level of a “train whistle at 500 feet” according to the charts, and the Fiamm Freeway Blaster horns do have a “presence” that commands attention. The Fiamm Freeway Blasters registered a disappointing sound volume in our evaluation, technically speaking, but they are relatively compact and probably much louder than any stock motorcycle horn. They’re inexpensive, and can be found for $30.00 the pair Just remember that there are several very close counterfeits out there — make sure you’re getting the original. From “I” (1/09): “While I don’t own nor have I heard the Fiamm Freeway Blaster horns in person, I have worked as a sound engineer for many years I may have a suggestion for you that may improve the dB levels you have been getting from these horns. There are three parts that go into making a speaker: a driver or drivers (typically a diaphragm driven by an electromagnet), a box (encases the driver), and a horn (mounts in front of the driver) The only required piece to make noise is the driver, but by itself it is not very efficient (i.e. loud) and the sound quality tends to be poor. This is where the box comes in In addition to providing a place to mount the driver, the box minimizes interference between the sound wave emanating from the front and the back of the driver by controlling the pressure changes on the back of the driver The horn shapes, directs and provides impedance matching for the sound waves generated by the driver.